For our wedding anniversaries I try to give my wife, who doesn't climb much, a present of a memorable adventure. I thought The Old Man of Stoer in the North West of Scotland would provide it; a VS/HVS route, exposure, abseils, a swim to the base, what more could she ask? On the day, she won the toss for the swim lowering herself into the icy sea with the rope end tied to her waist. I rigged the Tyrolean and came over dry and fully clad with the rest of the climbing gear as she muttered darkly. She had a few grip­ping moments climbing and coming down the airy abseils, and congratulated herself on avoid­ing the fulmar chicks occupying the ledges. These sea birds with attitude cover you with pungent puke if you get too close — not difficult on a sea cliff, since their range is easily four feet. We had a perfect day ,after all, the attraction of these wonderfully situated climbs is not the grade but the whole atmosphere. Safely back at the top of the mainland cliff Marea said how much she'd enjoyed it. Was this the moment to tell her what I'd spotted as we sat in the sunshine atop the Old Man. 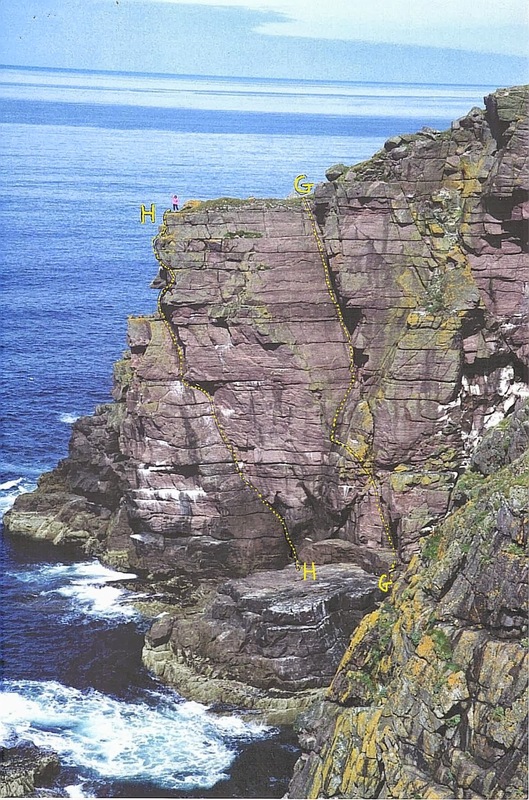 For clearly visible half a mile north were two very promi­nent lines on a striking piece of cliff at the actual Point of Stoer. The new Northern Highlands guidebook made no mention of any climbs in the area other than on the Old Man, so I inno­cently suggested a picnic for the next day. As we set off she looked suspiciously at my enormous pack but I said I had some gear to maybe shunt something while she was painting. Marea settled down with her watercolours and I scrambled along the narrow point to the top of the very large corner I had seen. With perfect, clean rock it looked just too good to be true. 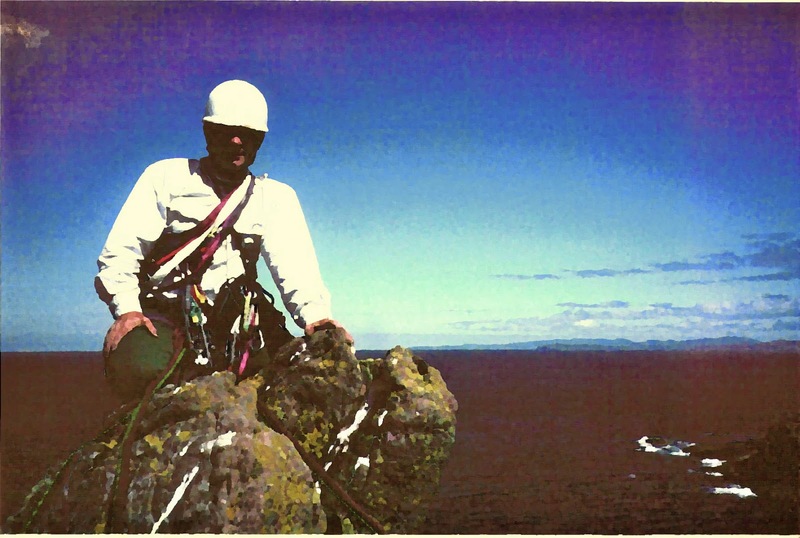 I tied off my 180ft rope and threw it down the cliff, the end whistling out of sight towards the sea. I carried on descending with the rope fortu­nately reaching a platform about 160ft down, just above the high tide mark. I clipped on the Shunt and marvelled as I climbed back up this superb line, at about Severe standard. I enthused over it to Marea and since I'd luckily brought her shoes and harness in the pack it wasn't too long before I persuaded her to abseil down the single fixed rope to the platform. Using our spare 9mm rope we climbed the two pitch route with much en­joyment. Although to our right was a very large bird colony we met no nesting birds on this climb, which we called simply The Great Comer. About 40ft to its left was the other corner line I had spotted from the Old Man but inspec­tion from above was difficult because of the over­hangs in that area of the cliff. I got Marea down to the platform again so that I could attempt this route on sight. It looked quite spectacular and a lot more difficult but I convinced her if it proved too hard for her, she could jumar back up the abseil rope. I had to descend slightly to reach the foot of the corner, a little below the high water mark. Once in the corner the climb­ing was much easier than it appeared and a wonderful Hard Severe. One 11Oft pitch brought me to a flat edge under a roof right on the prow of the Point of Stoer. Marea soon joined me, pleasantly surprised by the reasonably easy grade. 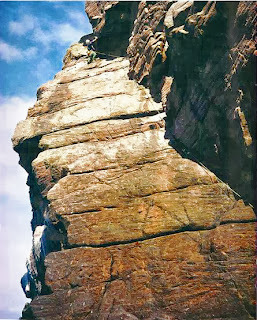 A few feet above the belay ledge was a perfect roof split by a head sized off width crack. Climbing this crack would have made the route much more difficult but it just looked too tempting. The alternative was a very exposed, scary looking traverse under the roof and above another roof into territory with no obvious outcome. After a couple of attempts at the crack, where both times my helmet be­came jammed, I realised a slip after cutting loose through the roof could result in me hanging in space by my helmet — not a pretty sight. Now I would have to make the exposed traverse right which once again proved easier than it looked. A little groove appeared to the right of the roof and enabled me to traverse left until I was back at the top of the crack and directly above Marea. So far the route had been free of any puking fulmars. Now ten feet from the top sat a very fat chick and by the look on his face, he was fully loaded... On the Old Man of Hoy I'd encountered both adult birds and chicks defending themselves with an apparent inexhaustible supply so I devel­oped the technique of waggling my foot just out of range enticing them to discharge and nipping past in the few gulping seconds they take to re­load. Fortunately this one was in a good position for the waggle technique. I dodged as two good-sized bursts of half-digested fish went whizzing down the crack to score a direct hit on Marea's helmet and brand new wind parka. She was not a happy lady.The birds once overtaken show no further signs of distress, and generally sea birds act unfazed by our presence. I've seen puffins hap­pily feeding sand eels to their young as I was belayed two feet away. My timing was perfect and I pulled out unscathed on to the top of this great little route. The final pitch, though very exposed, proved no more than mild VS — a truly perfect outcome to a perfect day. I held my nose and gave Marea a celebration hug. We had been very fortunate to find two three star routes of pure enjoyment in a perfect setting and I would not swap the experience of climbing these two gems for the World's hardest E9 bolt ladder. The next day we headed north to the sea cliffs of Sheigra near Cape Wrath. Here I shunted some excellent routes put up by my old Alpha Club friend, Paul Nunn, who began exploring in this area when I was living in the US. I had missed this early scene but noticed in the new guide that Paul was still exploring these areas, and re­solved to tell him how great I found them, and if ever he needed a partner I'd be really keen. Ar­riving home we found that two days before our ascents on the Point of Stoer, Paul had been killed in the Karakoram on the way down from the first ascent of a mountain called Haramosh 11. Long ago in 1965 he and I shared some good times new routeing on Eagle Crag in Borrowdale and one of these routes he named The Sprogg in honour of my son Andrew, born two days prior to the ascent. 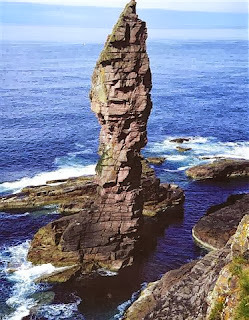 In return, I thought it a fitting trib­ute to name our beautifully situated climb on the Point of Stoer Haramosh. Paul's favourite retreat was the North West of Scotland and the Stoer Peninsula embodies all the mystic beauty he loved so well. 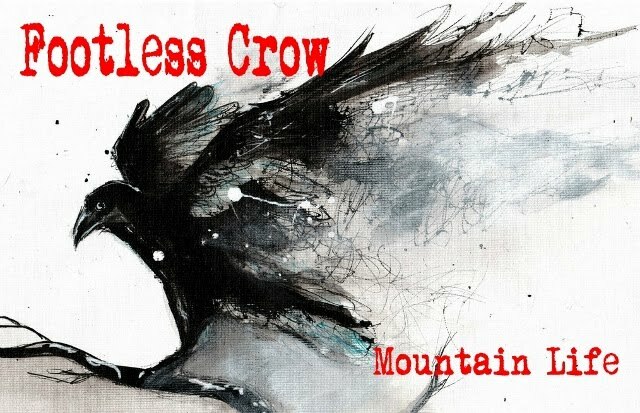 Paul Ross: First published in High-162. 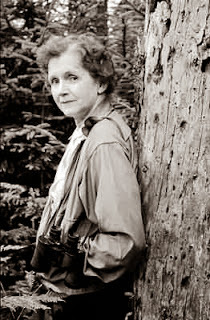 Silent Spring has come to be regarded as an environmental classic which instigated the modern environmental movement. The book’s warning about the dangers of pesticides touched a nerve, but also reflected wider concerns in the emerging counter-culture of the sixties – that modern technologies, combined with rampant consumerism, were causing environmental problems that had otherwise not been widely noticed or, worse, suppressed by vested interests. 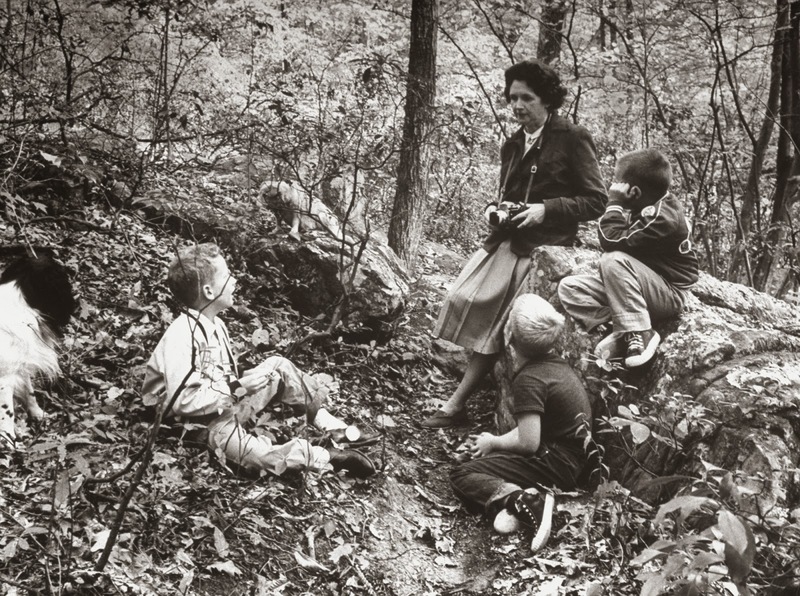 There was once a town in the heart of America where all life seemed to live in harmony with its surroundings. The town lay in the midst of a checkerboard of prosperous farms, with fields of grain and hillsides of orchards where, in spring, white clouds of bloom drifted above the green fields. 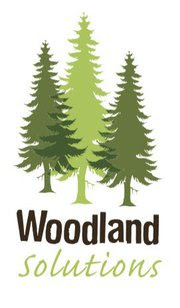 In autumn, oak and maple and birch set up a blaze of colour that flamed and flickered across a backdrop of pines. Then foxes barked in the hills and deer silently across the fields, half hidden in the mists of the autumn mornings. Among the roads, laurel, viburnum and alder, great ferns and wildflowers delighted the traveller’s eye through much of the year. Even in winter the roadsides were places of beauty, where countless birds came to feed on the berries and on the seed heads of the dried weeds rising above the snow. The countryside was, in fact, famous for the abundance and variety of its bird life, and when the flood of migrants was pouring through in spring and autumn people travelled from great distances to observe them. Others came to fish the streams, which flowed clear and cold out of the hills and contained shady pools where trout lay. Sot it had been from the days many years ago when the first settlers raised their houses, sank their wells, and built their barns. There was a strange stillness. The birds, for example – where had they gone? Many people spoke of them, puzzled an disturbed. The feeding stations in the backyards were deserted. The few birds seen anywhere were moribund; they trembled violently and could not fly. It was a spring without voices. On the mornings that had once throbbed with the dawn chorus of robins, catbirds, doves, jays, wrens and scores of other bird voices there was now no sound; only silence lay over the fields and woods and marsh. On the farms the hens brooded, but no chicks hatched. The farmers complained that they were unable to raise any pigs – the litters were small and the young survived only a few days. The apple trees were coming into bloom but no bees droned among the blossoms, so there was no pollination and there would be no fruit. The roadsides, once so attractive, were now lined with browned and withered vegetation as though swept by fire. These, too, were silent, deserted by all living things. Even the streams were now lifeless. Anglers no longer visited them, for all the fish had died. In the gutters under the eaves and between the shingles of the roofs, a white granular powder still showed a few patches; some weeks before it had fallen like snow upon the roofs and the lawns, the fields and the streams. This town does not actually exist, but it might easily have a thousand counterparts in America or elsewhere in the world. I know of no community that has experienced all the misfortunes I describe. Yet every one of these disasters has actually happened somewhere, and many real communities have already suffered a substantial number of them. A grim spectre has crept upon us almost unnoticed, and this imagined tragedy may easily become a stark reality we all shall know. The history of life on earth has been a history of interaction between living things and their surroundings. To a large extent, the physical form and the habits of the earth’s vegetation and its animal life have been molded by the environment. Considering the whole span of earthly time, the opposite effect, in which life actually modifies its surroundings, has been relatively slight. Only within the moment of time represented by the present century has one species man acquired significant power to alter the nature of his world. It took hundreds of millions of years to produce the life that now inhabits the earth eons of time in which that developing and evolving and diversifying life reached a state of adjustment and balance with its surroundings. The environment, rigorously shaping and directing the life it supported, contained elements that were hostile as well as supporting. Certain rocks gave out dangerous radiation; even within the light of the sun, from which all life draws its energy, there were short-wave radiations with power to injure. Given time – time not in years but in millennia - life adjusts, and a balance has been reached. For time is the essential ingredient; but in the modern world there is no time. The rapidity of change and the speed with which new situations are created follow the impetuous and heedless pace of man rather than the deliberate pace of nature. Radiation is no longer merely the background radiation of rocks, the bombardment of cosmic rays, the ultraviolet of the sun that have existed before there was any life on earth; radiation is now the unnatural creation of man’s tampering with the atom. The chemicals to which life is asked to make its adjustment are no longer merely the calcium and silica and copper and all the rest of the minerals washed out of the rocks and carried in rivers to the sea; they are the synthetic creations of man’s inventive mind, brewed in his laboratories, and having no counterparts in nature. To adjust to these chemicals would require time on the scale that is nature’s; it would require not merely the years of a man’s life but the life of generations. And even this, were it by some miracle possible, would be futile, for the new chemicals come from our laboratories in an endless stream; almost five hundred annually find their way into actual use in the United States alone. 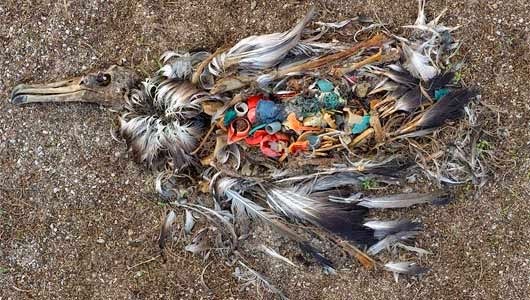 The figure is staggering and its implications are not easily grasped: five hundred new chemicals to which the bodies of men and animals are required somehow to adapt each year, chemicals totally outside the limits of biologic experience. Among them are many that are used in man’s war against nature. Since the mid-1940′s over 200 basic chemicals have been created for use in killing insects, weeds, rodents, and other organisms described in the modem vernacular as “pests”; and they are sold under several thousand different brand names. Along with the possibility of the extinction of mankind by nuclear war, the central problem of our age has therefore become the contamination of man’s total environment with such substances of incredible potential for harm substances that accumulate in the tissues of plants and animals and even penetrate the germ cells to shatter or alter the very material of heredity upon which the shape of the future depends. . . .
What is the legacy of Silent Spring? There are some interesting opinions and archive materials in this discussion, hosted on The Guardian website,while the Life and Legacy of Rachel Carson can be explored on this website. 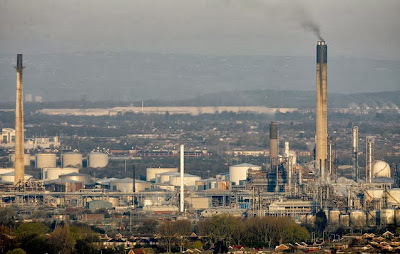 Reading Silent Spring today, it is disquieting to realize how much was already known in 1962 about the environmental health impacts of petrochemicals. Even more shocking is to recognize how little our regulatory response to these chemicals’ effects has changed, despite the past five decades’ great advances in scientific understanding. 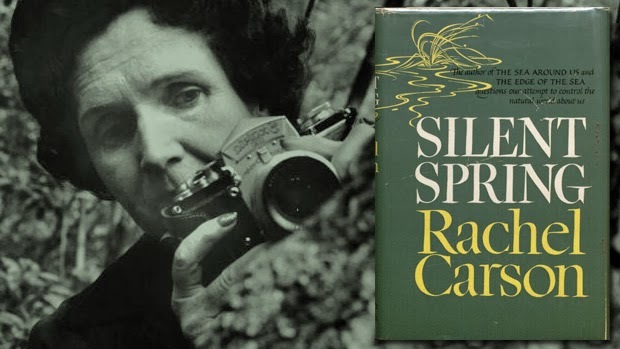 Best known for its alarming account of DDT’s decimation of bird life across the United States, Silent Spring is widely credited with sparking the public concern that lead to the chemical’s ban in the US ten years later. “Over increasingly large areas of the United States, spring now comes unheralded by the return of birds, and the early mornings, once filled with the beauty of bird song, are strangely silent,” Carson wrote, describing the toll pesticide use had taken on American birds. Without changes in practice, brought about in part by Silent Spring, the bald eagle (whose numbers had plummeted to about 400 breeding pairs in the continental US by 1963) might well have disappeared from the lower 48 states. But Carson also described the accumulation of synthetic chemicals in people – including newborns – and these chemicals’ interaction with the innermost workings of living cells. “For the first time in the history of the world, every human being is now subjected to contact with dangerous chemicals, from the moment of conception until death,” Carson wrote. “These chemicals are now stored in the bodies of the vast majority of human beings, regardless of age. They occur in the mother’s milk, and probably in the tissues of the unborn child,” wrote Carson more than 40 years before an Environmental Working Group study found 287 industrial chemicals in newborns’ umbilical cord blood, and decades before the Centers for Disease Control and Prevention began finding such chemicals in the majority of Americans tested. A year ago I wrote that I had been listening to The Essay on Radio 3: five talks on the theme ‘Before Silent Spring‘ in which five writers, scientists and environmental campaigners reflected on how Carson built on the work of others who had gone before her, figures whose ideas preceded Silent Spring and laid the foundations of the contemporary environmental movement. Read that post here. 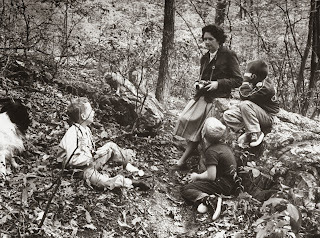 One of the core lessons of Silent Spring was that things labelled progress weren’t necessarily good. Another was that the perceived split between man and nature isn’t real: the inside of your body is connected to the world around you, and your body too has its ecology, and what goes into it – whether eaten or breathed or drunk or absorbed through your skin – has a profound impact on you. We’re so used to thinking this way now that it’s hard to imagine a time when general assumptions were different. But before Carson, they were. In those years, nature was an “it”, an impersonal and unconscious force; or, worse, malignant: a nature-red-in-tooth-and-claw bent on afflicting humanity with all the weapons at its disposal. Against brute nature stood “we”, with our consciousness and intelligence. We were a higher order of being, and thus we had a mandate to tame nature as if it were a horse, subdue it as if it were an enemy, and “develop” it as if it were a female bustline or a male set of Charles Atlas biceps – how awful to be underdeveloped! We could then exploit nature’s resources, which were thought of as inexhaustible. Three streams of thinking fed into this civilisation/savagery construct. The first was biblical dominionism: in Genesis, God proclaims that man has dominion over the animals, and this was construed by some as permission to annihilate them. The second was informed by the machine metaphors that colonised linguistic space after the invention of the clock, and that spread across the west during the 18th-century enlightenment: the universe was an unfeeling machine, and life forms too were machines, without souls or consciousness or even feeling. Therefore they could be abused at will, because they weren’t really suffering. Man alone had a soul, situated inside the machine of his body (possibly, thought some, in the pituitary gland). In the 20th century, scientists threw out the soul but kept the machine: for a strangely long time, they held that to ascribe anything like human emotions to animals was anthropocentrism. Ironically, this was a direct contradiction of the granddaddy of modern biology, Charles Darwin, who had always maintained the interconnectedness of life, and – like any dog owner or farmer or hunter – was well aware of animal emotions. The third line of thinking came – again ironically – from social Darwinism. Man was “fitter” than the animals, by virtue of his intelligence and his uniquely human emotions; thus in the struggle for existence man deserved to triumph, and nature would have to give way eventually to a fully “humanised” environment. Gerry Cordon: First Published on-That's How The Light Gets In. 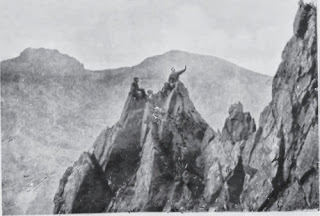 The place possesses a distinct allure: nowhere in Wales could a more confused and romantically sculptured disarray of rock be found; loose it may be, but like many a loose climb it scarcely lacks character or attraction. 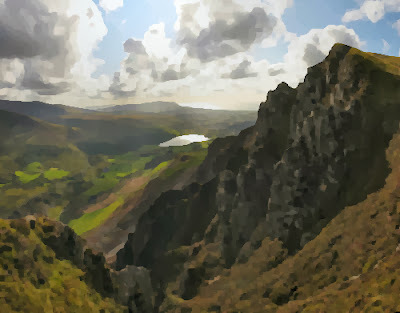 Typical journey into Wales, away from the coastal sands towards the hills to the west of Snowdon and under threats of rain down the valley towards Nantlle, above which, on Craig y Bera, hangs a neglected gem of a route, Angel Pavement. It was 13 years since my only ascent of it. As the years have passed, that climb has glowed with memories of delicate moves, serious situations and of the old team I used to climb with.Now, as I saw with relief that the heavy wet clouds seemed to rest just on the top of the route, I remembered that clear spring weather when we burst out of Sheffield on a day trip to do it. The chanting song on the car radio seemed to have got it exactly right: The first thing I met was a fly with a buzz, And the sky with no clouds. The heat was hot and the ground was dry But the air was full of sounds.We'd spent a weekend at Cwm Silyn and driving home up the valley from Nantlle we noticed this south-facing ramp of slab, nearly 500ft long, narrowing as it side-steps to the left of overhanging rock. Angel Pavement was in the new selected climbs guide 1970), where Ron James explained why we'd never heard of this long line of pinnacled rocks: 'This large cliff is composed (or decomposed!) of numerous totty ridges.' 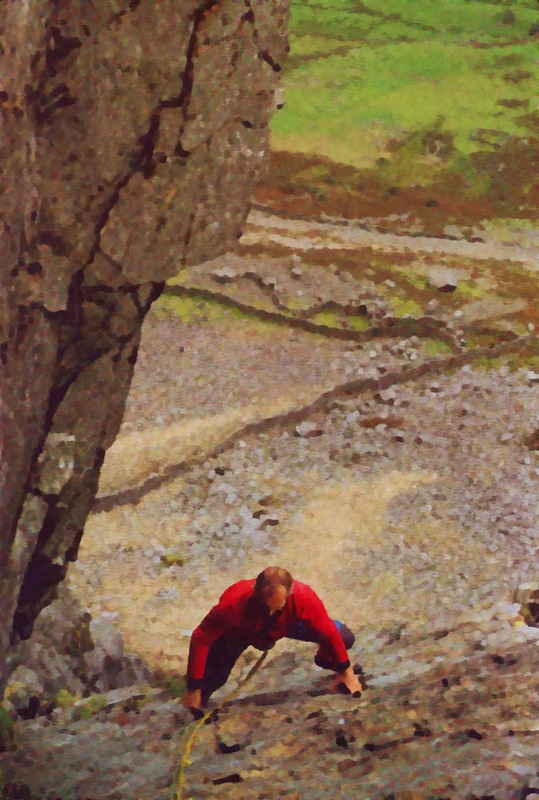 But here between them lay the irresistible line of Angel Pave­ment, the first of Tony Moulam's honourable list of new routes in Wales and graded by him Severe in nails. We had had to wait until the following Sunday to step on to that sunny pavement of slab. Now, 13 years later, I was again driving from home to Craig y Bera, already late in the day and in the wettest August for years. `It's going to rain, can't you feel it?' Mrs Evlyn Jones told me, painting her gate at the farm below the crag, duffle-coat hood over her head, on the last day of August. A peregrine was calling above us. Haskett-Smith on the first ascent of neighbouring Pinnacle Ridge in 1911. The guide warns that access to the crag is not allowed by the farmer living below it and that the situation is delicate, so I asked this diminutive lady with the round smile and ready wit how I should approach the crag and where to park. `You can leave your car here and tell my husband I told you so. He's gathering stones on the hill there.' And he was, gathering stone into great molehills to make a scrap of cultivation on a level bit of hillside. 'In the villages that nestle on these slopes lived a special brand of people, little known to the brightly clad hordes that pour into Pen y Pass car park every weekend', wrote Dewi Jones. 'These are the Tyddynwyr (small-holders) and the quarry-men, an almost vanished race.' Gathering stones below this tottering mountain as we made our way up to the unstable scree was a tyddynwyr of the almost vanished race, straightening up to look at us as we passed above him. We didn't necessarily expect to be allowed these indulgences of access another time. But what indulgences? The direct approach to Angel Pavement is a moving pavement of scree on which you feel as if you're going up the down escalator. It's still best to do as Tony Moulam did a week after I was born and traverse into the crag from the head of the valley. The route description of Angel Pavement is actually superfluous, such is the purity of its superb line. I had forgotten how easily it starts, scrambling up heathery rock ledges until a little route-finding linking the ledges is necessary. I found only one runner in a full rope run-out, but no move is more than Diff. The second guidebook pitch is harder and actually best taken as two 75ft pitches of good friction and square-cut little fingerholds. Whenever a straight-up approach meets steepening rock a solution is to be found on the left. The next stance is the crucial one, cramped under a dribbling roof in which you'll find two small chockstones, although nuts can be added easily to improve the confidence. I remembered my former leader, John Driskell, disappearing left round the corner from here where the slab narrows and steepens to a little wall. The slab is undercut below and by this height has leaned a long way left. Now the evening light had shrunk to the bottom of the valley below the slab. John had had not one brain hemorrhage, but two since I watched him confidently step out on to the edge where the last light now gathered. He still comes camping up in the high cwms with us, watching his pulse-rate methodically, mocking our modern gear and our not climbing in 'a little light drizzle'. To him I owe a lot of my first VSs, as his enthusiasm pulled me upwards against my instinctive reluctance. And I owe to him my memory of this route and this little crux. It's certainly a Severe move on a route that is still graded V Diff,*( Now severe in the latest CC guide) although from here you'd fall off the slab and hang in air. Angel Pavement has a deep gutter and if you step off the edge of the pavement you'll need the wings and luck of an angel. 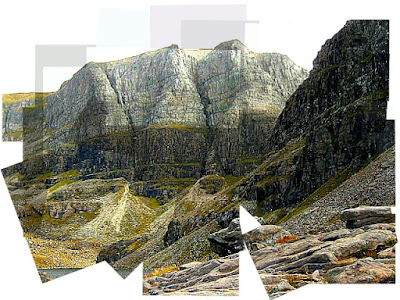 Above this pitch the rock gives way to scrambling over grass and heather laced with gorse. There is just one more move round a corner which causes you to work out how to finger the clean-cut angles of steep rock to the right. But the belays are big sociable eyries where, 13 years ago, I had chatted to Dave as he brought up Agnes behind John and I. It must have been one of Agnes' first climbs.The rumour in the pub had been that Dave had met this girl at a campsite in the Alps. Since Dave was a confirmed, pipe-stinking bachelor, there was much doubt about the story. Then one Friday evening as we were assembled in the back room of the Nursery Tavern as usual, Dave appeared in the doorway with a small, shy girl who didn't speak a word of English. Dave had just brought her from East Midlands Airport on the back of his motorbike. At that precise moment, as she was having her first taste of Mrs Jenkins' best bitter, her parents thought she was at the pictures in Paris. She climbed Angel Pavement without hesitation too. Back to the present — the light had now almost gone and what I'd not remembered was how to get down. I kept leading left, avoiding loose rock and the abyss below as much as possible, until the neck behind the buttress dipped down the other side to a scree descent to end all scree descents, unless you're careful. We got down to the farm in the dark. Mrs Jones was shutting up the hens with a torch. She had obviously been keeping an eye out for us. There was sand and hills and rain. But the air was full of sounds.